Cats are masters at hiding illness, and it’s often easier to note a change in their behavior than the illness itself. Here are some changes to watch for. Cats need to eat regularly. If your cat stops eating, you need to consult a veterinarian. There may be reasons that aren’t connected to health issues, such as stress, but fasting in itself can cause illness. 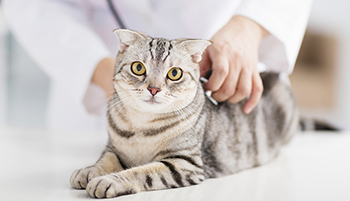 If your cat shows a sudden increase in appetite, they also need to see a veterinarian. A sudden boost in hunger can be due to anything from inflammatory bowel disease to hyperthyroidism, and the quicker a condition is diagnosed, the better it can be treated. Cats need to drink water, and many kitty parents worry about their cats not drinking enough. A sudden increase in thirst can be an indicator of urinary tract issues, diabetes, or thyroid problems. If there is a problem, your cat will be grateful for having it treated as soon as possible. There can be many reasons a cat stops grooming, for instance obesity or joint pain that makes some areas difficult to reach. It may also be connected to pain from dental disease or an injury. Speak to your veterinarian to rule out medical conditions. Periodontal disease is a problem; as many as 85% of cats will suffer periodontal disease by the age of three! Bad breath is a sign, and dental issues can lead to other problems such as heart problems. Bad breath can also indicate other health problems, such as kidney disease or diabetes. Cats meow for many reasons, and most pet parents learn to distinguish one meow from the other. A cat talking a lot – or rarely – doesn’t mean they’re sick. But, if you have a normally quiet cat who suddenly starts meowing a lot, or a normally chatty kitty who stops meowing, there may be a problem. A cat who always used the box will not start going outside it for no reason. There are people who believe cats pee outside the litter box because they misbehave or want to mess with us humans, but that isn’t the case. First look at the box: Has something changed? Is it scooped regularly? Has it moved? Have you started buying a new type of kitty litter? Has something else in the household changed? Did someone move in or out, a new pet, or another new routine? Stress affects cats’ behavior. Cats who stop using their box and seek out another spot often associate the box with something negative – such as pain. They may have arthritis and need a box with a lower edge, kidney stones, or a urinary tract infection. The vet can help! Everyone has times when they want to be left alone, and this goes for cats too. But, an ongoing change in behavior can mean that something is wrong.